4 Brewing Da Hong Pao? Sort Tea Da Hun Pao (in the lane. a whale. "Big Red robe") It is one of the most famous and illustrious silnofermentirovannyh oolong, the so-called tea utesnyh, grown on hot rocks Ui, Fujian province. The leaves have a bluish-purple, as if covered with a brownish patina. Color is highly reminiscent of dark gold, iridescent reddish highlights. The aroma of dried tea is very warm, sweetish, with hints of flowers, wine, spice. The taste tight, It has a pleasant tartness, spice, bright honey and fruit notes, long sweet aftertaste. However, the most controversial tea to taste. Someone there will feel notes of vanilla, caramel, butterscotch, chocolate, there are so many amazing hints of taste, that everyone is free to find something of their own. 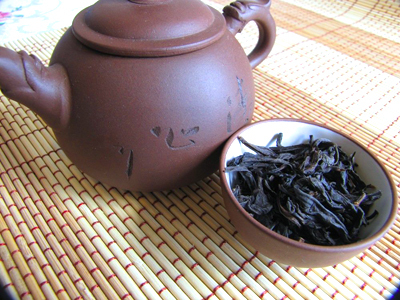 Elite grade Da Hong Pao is maintained by 10 to 15 and above brewing. The higher the number of tea, so it is better quality. Collection of tea is produced 4 once a year. But the most flavorful and rich considered autumn varieties. The impact of tea on the body can have individual characteristics, but are characteristic: warm and relaxing, remove the tension, tonic, inspired mood, tea cleans the body of toxins, strengthens, lowers blood pressure, relieves spasms of the head vessels. I boldly give big red gown. That's what I liking, so it is – Da Hong PAO”. It was a very hot summer day, when the young Ding Xiang went to take exams to the emperor, to get a good position at the court. Suddenly, he fell ill, He lost consciousness because of sunstroke. For luck, near a monastery, and his sickness noticed the monk Tian Xing Si, which led him to his senses, and given to drink a cup of tea healing. The boy was able to quickly regain strength, and even bought an amazing clarity and sharpness of mind, which helped him to successfully pass all the exams, to get a high position and a red silk robe with a dragon in the award. In gratitude for the wonderful salvation Ding Xiang decided to present a beautiful robe monk, that saved him, but he, I am a Buddhist, I did not accept the gift. Therefore, the young man gave his red robe tea bushes, received ever since the name Da Hong Pao. 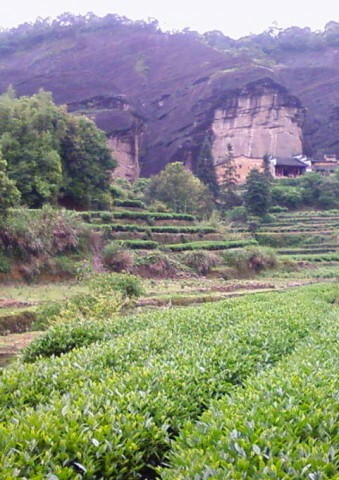 To date, there are only 4 bush of the oldest tea, so the original Da Hong Pao tea is extremely small. Is it worth it incredibly expensive, It is the most expensive tea in the world. Afford the luxury Only the richest people of the world. for example, President Nixon presented 50 g nastoâŝego Da Hun Pao, the price of which today would have been 250 thousand. dollars. Everything, that is sold today under the name Da Hong Pao tea - the descendants of those very maternal bushes, propagation by cuttings, which are grown in the same climate. therefore, do not worry, let the tea and not of purebred bushes, but none the worse. He is invariably excellent, healing, delicious, fragrant and invigorating tea. Tea take only bottled soft, non-carbonated water. Prepare a small ceramic teapot for tea leaves, water, put on fire in another vessel, to boil. Not perekypyatyte water, as soon as the go from the bottom of small bubbles, immediately turn off. As soon as the water boils, Rinse teapot scalded with boiling water, wait a minute, water drain, pour into it a little pinch of tea Da Hong Pao, fill 150 g of boiling water before, close the lid, Wait for the first couple of minutes of welding (for subsequent zavarok time increases by half a minute each time) and pour into small cups, filtering through a strainer. Enjoy!